Our brand new Marketing Communications intern Lauren has finally arrived to join us all the way from Scotland! Lauren is a 3rd year undergraduate student at the University of Strathclyde and is part of the prestigious Saltire Scholar Internship Program – having been competitively selected from hundreds of applicants across Scotland’s universities. This exciting program is the creation of the The Saltire Foundation, an independent Scottish charity whose mission is to find, fuel, and spark the next generation of business leaders in Scotland. Through 10-week summer placements – working in highly successful firms or high growth entrepreneurial companies at home and abroad – young people are given the essential tools, coaching, and opportunities to develop their business skills and experience in a real work life settings. Here at NTSUSA, we firmly believe in supporting Scotland’s young talent as well as its natural, built, and cultural heritage, which is why we are delighted and proud, for the fourth consecutive year, to host a Saltire Scholar. 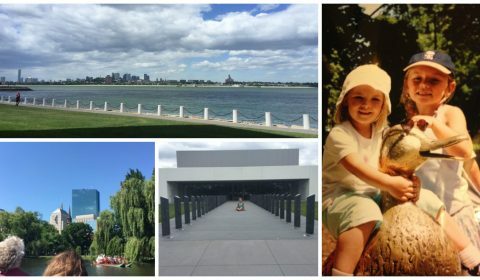 Below is Lauren’s very first blog for NTSUSA. Hello NTSUSA blog readers, I am delighted to introduce myself as the Foundation’s newest marketing communications intern for the next ten weeks. My name is Lauren Bryce and I am from a small village on the East Coast of Scotland called Gullane. Well known in the golfing world for hosting The Open Championship at Muirfield on numerous occasions and most recently in 2014, which I was lucky enough to attend. I would love to say that being surrounded by five golf courses has led to being a good golfer myself, but despite the fact I have played from the age of seven, taking six hours instead of three to complete a game and frequent cries of “FORE!” are much too common in my attempts to play. So, for the safety of the much better golfers in Gullane, I stick to the kids course and take up my (very competitive) family on their weekend competitions. 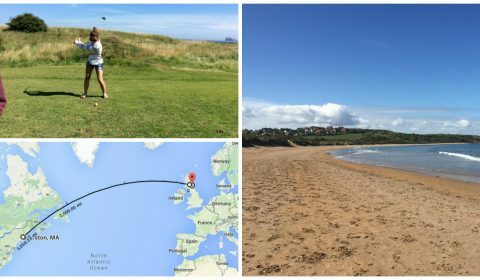 Aside from the golf courses Gullane also has an award winning beach which stretches for miles with views of the capital city of Edinburgh. While I love living in Scotland and close to a beach the weather is far from desirable. I am thoroughly enjoying the warmer weather over here in Boston, my handbag is ten times lighter with not having to carry clothing for all four seasons as the temperamental Scottish weather normally requires. Having only visited Boston once and over 13 years ago I don’t remember much so I am very excited to be back. I love exploring new cities and my haphazard nature seems to suit Boston particularly well, no matter where you wander to there is always something going on and yet another amazing place to eat. Despite only having been in Boston for a few days my pedometer informs me that I have already walked over 50 miles since arriving! Despite the sore feet I can confidently say I am in love with this city. Every day I am stumbling upon somewhere new to explore – one nice looking park and I’m off down a street and totally lost within seconds. Maps tend to be forgotten and left in the apartment no matter how many times I leave a note by the door to remember them! One thing I have learned from a very nice Uber driver is to always look for the skyscrapers, walk towards them for the city and away from them to get home – so far that’s all the direction I’ve needed. The other Saltire interns are often in disbelief, yet equally proud, when I make it home without having been on the T in the wrong direction at least once during the day. While I come from a small village, I am used to city living having moved to Glasgow three years ago where I study Marketing at the University of Strathclyde. It is my favorite city in Scotland steeped in the work of one of the most significant architects and artists from Scotland, Charles Rennie Mackintosh. 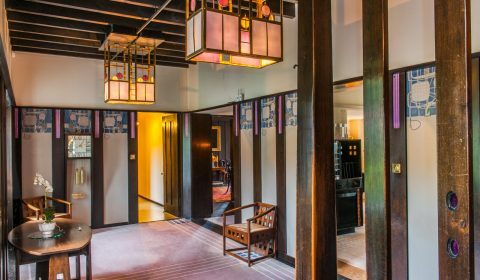 You can see his influence all over the city from tea rooms to art galleries and of course, The Hill House which is one of this year’s priority projects for the NTSUSA and regarded as his finest domestic commission. Having been a member of the National Trust for Scotland from a very young age I have visited many of their sites, with a particular fascination for the castles, where my sister and I would play and explore for hours on end. Crathes Castle is one of my favorite of the sites, having visited it more times than I can count over the last 20 years. 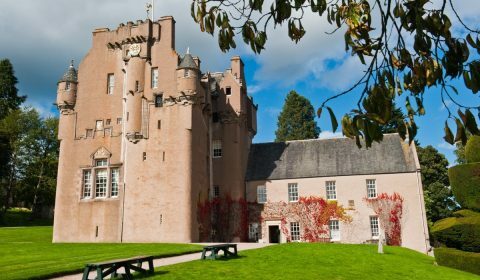 Dating back to the 16th century, the castle and its surrounding would not be able to maintain their beauty without the donations and support from members and donors from the NTS and the NTSUSA, demonstrating the influential effect an individual can have on keeping the heritage of Scotland alive. It is thanks to The Saltire Foundation that I am here in Boston and working for the NTSUSA. The Saltire Foundation’s mission is to promote Scottish business and find and nurture the next generation of business leaders. Becoming a Saltire Scholar is a truly unique opportunity, having the responsibility of representing Scotland and highlighting its potential in the form of this internship is something I am extremely honored to do. I am proud to be Scottish and I believe it is important that the heritage shared by Americans and Scots is protected for both current and future generations. This belief encouraged my application to the Foundation and I am excited to be able to give back to the NTS in Scotland by encouraging memberships and donations here in America. The internship will involve content creation for blogs and email newsletters, developing a strategic editorial calendar, and interpreting and presenting data analysis for all of the Foundation’s communications platforms. My love and passion for marketing will be a strong foundation for increasing visibility and awareness of the NTSUSA across the country. Despite being over 3,000 miles away from my small village of Gullane, I feel at home in Boston. From my colleagues and flatmates to the people of Boston, everyone has been so welcoming. I can already tell leaving this city in August will be a struggle. I plan to enjoy every single minute of this amazing opportunity, and who knows maybe sometime over these next three months I will actually use a map, and see if I can stick to a path for more than five minutes before getting distracted by a food truck or a pretty fountain! You can follow Lauren’s journey through her Saltire Foundation blog too, by clicking here. Our social media sites are the best way to receive updates about what is happening at the National Trust for Scotland and the NTSUSA, and Lauren will be posting updates to them over the course of her internship. We are on Twitter, Facebook, Instagram and Pinterest.